What is Zitromax Oral Suspension (Azithromycin) used for? This product is manufactured in Turkey and does not contain English documentation. 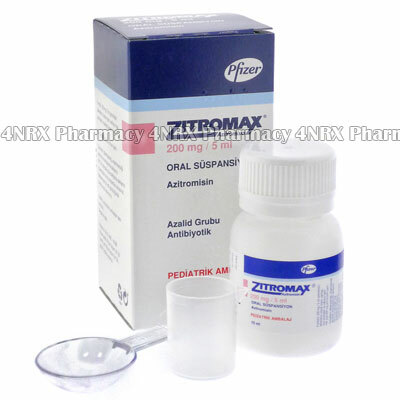 Zitromax Oral Suspension (Azithromycin) is a macrolide antibiotic prescribed to treat a large variety of bacterial infections. The medication stops the reproduction of bacteria cells allowing the immune system to naturally control or destroy the infection. It is commonly used to treat conditions such as lung infections, ear infections, Chlamydia, Lyme disease, or respiratory tract infections. Your doctor may also prescribe it to treat other unlisted conditions. How should I use Zitromax Oral Suspension (Azithromycin)? Follow your doctor`s directions while using Zitromax Oral Suspension (Azithromycin) to ensure the correct administration. The prescribed amount of solution should be taken once daily for a period of medication lasting one or two weeks, but your individual regimen will depend on your health condition and the severity of your symptoms. Do not stop taking the medication prior to being told to do so as the infection may not be gone and can return stronger or more resistant to treatment. Use the included measuring device to ensure the correct dosage is administered. You are recommended to drink a cup of water after each use to rinse the mouth ensuring the entire dose is consumed. Ask your pharmacist or doctor any questions you have about the medication to ensure the correct usage. What are the side effects of Zitromax Oral Suspension (Azithromycin)? More serious side effects that may require medical assistance are chest pain, severe headaches, discoloured stools, discoloured urine, severe skin reaction, or intense diarrhoea that is bloody or watery. These conditions may require medical assistance or changes to your dosage to prevent further complications from occurring. Before beginning the use of Zitromax Oral Suspension (Azithromycin), inform your doctor if you have an irregular heart rate, heart failure, myasthenia gravis, or diabetes as these conditions may cause unexpected health problems during treatment. Strictly use Zitromax Oral Suspension (Azithromycin) as prescribed and follow all instructions provided by your doctor. Safe, suitable, and optimum dosage can vary and is dependent on the patient`s health and medical history, as well as the condition you are treating. Zitromax (Azithromycin) may not be safe or suitable for all patients. Always ensure your doctor is informed if you are pregnant or breastfeeding, using any other type of medication (including non-prescription medicine, vitamins, and supplements), as well as if you have any allergies, other illnesses, or pre-existing medication conditions.